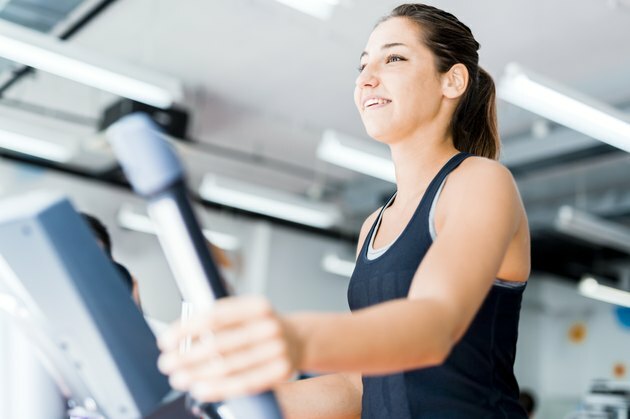 An elliptical machine takes the features from a treadmill and step-climber and combines them to provide a low-impact workout. These devices come with varying designs, depending on the manufacturer and model. One common component is the elongated pedals that you run on, and that your feet always stay in contact with. Some elliptical machines also have poles similar to those used in skiing that work the upper body. The quadriceps are the muscles that compose the front of the thigh. There are four major muscles included in the quadriceps grouping. These blanket the top of your leg to provide extension and contraction. An elliptical machine requires you to push down on the pedals. With every thrust, you force the quadriceps to flex to continue to propel your body forward on the equipment. As well, your hamstrings will benefit if your trainer has an incline function; if not, then use the machine in reverse. Other muscles in the legs, such as gastrocnemius, or calves, benefit from the up and down motion of an elliptical trainer as well. The abs are part of the body's core and provide stability for almost all positions, such as standing or sitting. One key to an effective workout on an elliptical trainer is to pull your abdominal muscles tight. This state of holding the muscles inward to provide good posture while working your legs will help to build the core foundation. Contraction is an important part of exercising any muscle group. Abdominal contraction is a good way to improve the effectiveness of the elliptical workout and improve muscle tone in your stomach area. The gluteus maximus muscles extend from the lower back to the side region of the thigh. When working out on an elliptical machine, you must apply force to the pedals. The gluteus maximus expands as one leg moves downward and contracts to pull the other one up. This movement will help to build strength in the buttocks and provide stability to the hips. The gluteus maximus is a large muscle group. Working large groups of muscles, such as the buttocks and abdominals, helps to burn calories and improve metabolism. Most modern elliptical trainers come with arm poles which gives you a chance to work the muscles in your shoulders, arms, chest and upper back to one degree or another. Your triceps are considered "pushing" muscles which have the effect of activating your pectoral muscles; and the biceps are the "pulling" muscles which engage your rhomboids and other upper back muscles; especially if you use the machine in reverse. Can I Use an Elliptical If I Have Shin Splints?